….One of my big observations about Julius Caesar is that he took great care in his career to do nothing that he could not credibly claim that a political or military leader had not done before him. Scipio Africanus used his huge prestige from winning a massive war for Rome to monopolize all political power within his own family. The Gracchi disregarded informal controls in the cursus honorum in favor of pursuing needed reform. Pompey used extraordinary and open-ended military powers to wage a war of conquest for Rome and got personally rich doing it. Catalina had been a blue-blooded populist who thumbed his nose at the consuls in power. Both Marius and Sulla had marched on Rome; Marius was consul six times in a row and Sulla was a dictator for longer than the traditional six months and used attainders to purge the ranks of the elites of his enemies. So all along, when people protested to Caesar that he was making himself into a king, he could point to precedent and say he was doing nothing new, and nothing that the republic hadn’t been through before without losing its republican character. This seemed a transparent fiction to his critics. But for a legal culture steeped in and heavily reliant on precedent, it mattered a lot. Not for nothing did Caesar spend the first chapter of both his books chronicling his own military conquests on offering political justifications for what he had done. After all nearly two centuries of history that preceded Caesar’s rise to power demonstrated that in order for the government of Rome to be effective, it took a blue-blooded strongman brushing aside the niceties of the anti-autocratic but ossified constitution to actually do something. And that same history demonstrated to him that the public admired success much more than it did formal adherence to the law – which had grown too complex, too much a creation of the elite, and too distant from the realities of daily life and popular culture, to matter all that much to the average Roman on the street. The formalities of government were for the elites to worry about, not the common man functionally unaffected by them; justice was obtained through informal means and not through the courts. First, I think Likko understood the limitations, frustrated ambitions and political immaturity of the anti-Caesarian and Optimate conspirators very well. Tyrannicide in classical antiquity was not mere political assassination, but a noble act, usually accompanied by martyrdom, which further sanctified it. This was true of the Athenians who had put up statutes of Harmodius and Aristogeiton who slew the tryrant Hipparchus and Lucius Junius Brutus, the ancestor of the assassin Brutus, was revered for his leadership in the overthrow of the Roman monarchy of the Tarquins. 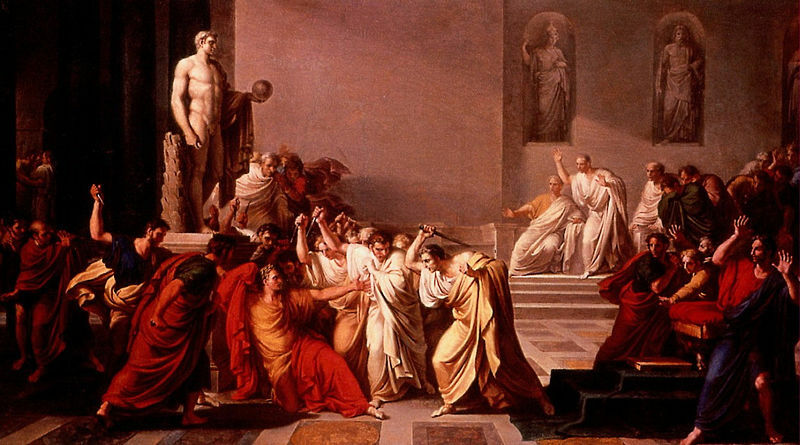 That the conspirators expected that the participation of Brutus in the murder of his patron Caesar would resonate symbolically as an intended gesture of patriotism with the Roman people was reasonable; the romantic hope the assassination itself would prove politically transformative was not. Likko was correct, Rome had changed since the second century BC – and not just from the abusive political intrigues of the Patrician elite but by the Social Wars that brought the bulk of Rome’s Italian allies into their political community as Roman citizens. The “People of Rome” had changed and the mob of landless poor – whom Populares like Caesar wished to aid with reforms over optimate objections – had grown much larger and dangerous. This goes to Likko’s larger point that, as revered as the Republican traditional virtues and outward forms may have been in terms of lip service, in substantive practice as the first century AD progressed, they were increasingly ignored when convenient to powerbrokers, the wealthier classes or the mob. Sulla’s attempt to “re-set” the Roman political system along traditionalist lines by blood purge and Cincinnatus-like personal example failed within a generation. Other than the terrifying example of the proscriptions to inculcate political restraint, which lasted only so long as Sulla lived, nothing else was introduced to tamp down the subversive dynamic of unrestrained and aggressive aristocratic political competition for imperium and glory by the ambitious among Rome’s elite. Some of this is right – the conspirators did not think clearly about politics, given the large numbers of patricians and rich “new men” alike who had fallen under Caesar’s spell or grudgingly accomodated themselves to his personal rule after the failure of Pompey and Cato. That they expected the sort of popular sympathy Cato received -really more public respect for his incorruptibility and intrangisent virtue than any widespread desire to emulate Cato’s antiquated Roman mores or reactionary politics – is itself evidence f how out of touch they were. That said, thinking in terms of institutions would have been nigh impossible for them. As an aristocratic Republic, Rome’s institutions that composed what we might call “the state” were very few in number and skeletal in form. This was because the expectation was that patrician leadership, informally exercised through their extensive clientelas, their public benefactions and donations, expressions of charismatic auctoritas even when not in power, would always provide the muscle to make things happen. These in turn would be regulated by age-old custom, tribunican vetoes, the signs of the augurs, the weight of Senatorial opinion and what formal laws existed. This however, is a mere quibble about a minor point in an excellent post. This entry was posted on Tuesday, March 19th, 2013 at 6:24 pm	and is filed under analytic, ancient history, blogging, blogosphere, dictator, government, history, ideas, intellectuals, leadership, legal, legitimacy, politics, roman empire, sic semper tyrannis, state failure, terrorism, Uncategorized. You can follow any responses to this entry through the RSS 2.0 feed. Both comments and pings are currently closed. Great post. But hopefully not timely for any Western nation! It raises one point, important although peripheral to the post: was Caesar an effective reformer? He had only a few years (46-44bc,). But his scattershot reforms fell far short of the massive structural changes Rome needed — and which his nephew provided. Not much evidence that Caesar had any clear idea where Rome should go. Of course, the new calendar was nice. This, I think, is a common theme of pre-modern history. A culturally cohesive (and generally very martial) society succeeds brilliantly, conquering its foes and establishing itself as a chosen people whose might is uncontested. In the early days strong cultural norms (manifested in customs or traditions) and a strong sense of social solidarity (“asabiyah“) makes the system work and keeps the group from tearing itself apart. But as old generations pass and new ones are born attachment to old cultural traditions wane and a sense of group interest is replaced by a sense of self interest. Because most pre-modern societies had very weak institutions, these cultural norms were really the only check against civil war or autocracy. When they go, so does the rest of the system. Modern societies (and the most institutionally ‘advanced’ of the old order) tend to respond differently. When trust, solidarity, and tradition don’t get things done the way they used to they can rely on institutions – so they do. More and more law and the government are called upon to do things civic society and local groups used to do themselves. We can see this in the decline of the Roman Empire itself. Local curiales dodged their position and their aristocrat friends fled the towns for landed estates in the country side, leaving and increasingly large and more complex bureaucracy to fill their own role; later Caesars begin to issues edicts setting prices or banning movement and social mobility – all things unthinkable in earlier times; the Emperor Claudius could walk freely about Palatine hill with other citizens, but approaching the emperor from the time of the Dominate forward an elaborate court rules and ceremony was required to keep the ruler safe; the simple law code of the Roman republic morphs into the byzantine (no pun intended) Code of Justinian. With each new problem we see increasing institutional complexity, which only causes tradition, culture, and solidarity to weaken further, bringing with it even more problems. The system hardens until some challenge – say, a Gothic incursion – is too large for it to handle, and then it just snaps. FM – That’s an interesting question. Caesar seemed committed to expanding stakeholders in Roman rule by bringing more wealthy plebians provincials and Romanized conquered elites into the system’s ruling class. OTOH Caesar had pressing obligations to his clentela and veterans to settle arrangements with first who had stood with him during the civil war. Egypt also commanded his attention as a source of spoils, assurance of grain reserves and his liaison with Cleopatra. Caesar was also, I suspect, feeling his age after years of very hard campaigning. Caesar had been in politics/public figure for a very long time, even catching Sulla’s disaproval and was probably the most flamboyant politician of his generation, after the notorious Cataline. I expect that Caesar had little that was new up his sleeve and was slowing down even as his workload and the number of supplicants seeking his ear had greatly increased. T.Greer – good draw from the Muqadimmah! Agreed! I think what you have described is the migration of rule-sets in the pre-modern from predominantly tacit to increasingly explicit ones in modern regimes. The explicit rule sets and explicit structures in the form of institutions improve society in some ways for enduring stress but the rigidity and lack of adaptivity of formal structures also harms. The real problem is a general lack of awareness among political elites that they are engaging in systemic trade-offs as their ad hoc responses to the crisis du jour accumulate over years and decades. There’s seldom a political incentive to stand back and assess what’s happening in the big picture and always vested interests to oppose changing course to avoid an approaching disaster.